Danish foreign missionary work had began in 1714 in the Danish colony Trankebar in India. After the turn of the 20. century missionary Edvard Løventhal was ad-vocating women missionaries to work in India, because men could not enter the houses, where the women were. In 1913 teacher and missionary Anne Marie Petersen (1878-1951) joined the elder Løventhal at his mission station, which she later took over. While doing research on Indian education Anne Marie Petersen and Mahatma Gandhi met for the first time in January 1917, long before Gandhi was a popular politician in the West. The Danish mission to India is a subject for the thesis “Dependency and Identity : Problems of Cultural Encounter as a consequence of the Danish Mission in South India between World Wars I and II” by Bent Smidt Hansen101. The contact on the one side between Danish missionaries, Scandinavian supporters of the Indian liberation movement and on the other side Mahatma Gandhi is documented in the forthcoming anthology “Gandhi and Nordic Countries”102. The meeting of Mahatma Gandhi and Anne Marie Petersen resulted in her establishing of an national Indian school at Porto Novo in 1921. Within the framework of the struggle for Indian political and social liberation Anne Marie Petersen and Gandhi pioneered a South-South dialogue. They were in India, but came from different cultures. Also it was an early North-South dialogue including development aid, because Anne Marie Petersen couldn’t have made her school as big as it became, without financial support from Christian friends and friends from the Folk High school movement in Denmark. 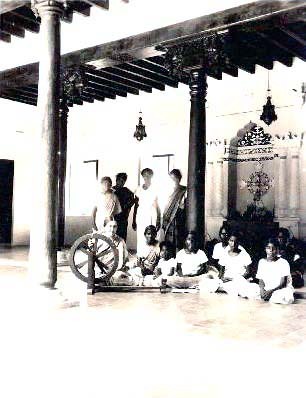 Some of the concepts and terms they used in developing an national Indian school system were later used in the development of the pedagogy of liberation, based upon the “ethical indignation, the preferential option for the poor and finally the liberation of the poor and oppressed - and of the oppressor”103. Thus during the early 1930s Gandhi literature was published in Denmark104; more than in the rest of the Scandinavian countries together. The Friends of India was organised by pacifist Ellen Hørup (1871-1953) in 1930 in Copenhagen, and the organisation published one of the first magazines outside India, promoting the Indian nonviolent political struggle for freedom. Both Ellen Hørup and the Friends of India organisation were under sur-veillance by British intelligence services in the beginning of the 1930s. After Ellen Hørup in 1933 moved to Geneva The International Committee for India was created. The Committee which had elected Ellen Hørup as secretary organised international conferences on the political situation in India and published a newsletter Indian Press to 1936. The Danish debate over peace education from the late 19. Century was renewed in the inter-war period105. In 1921 Quaker inspired teacher Peter Manniche (1889-1981) founded the International People’s College106 as an expansion of the (Christian national oriented) folk high schools. The Nordic Teachers Peace Union was created in 1925107 parallel to a growing debate amongst historians over nationalism and militarism in text books. The debate lead to a reform of Danish school books in 1933. The sixth International Montesorri Congress on peace education was held in Copenhagen in August 1937108. During the early twenties were founded Danish chapters of War Resisters’ International, Aldrig mere Krig, and the religious international organisations the World Alliance for Promoting International Friendship through the Churches and Faith and Order109. Around 1936 a Danish chapter of the International Friendship League was created, led by police chief C. R. Ege in Hobro110. In May 1933 the Danish chapter of the All Peoples Association’s invited Sir Norman Angell to a lecture in the Women’s Reading Society in Copenhagen111. 101 Aarhus University Press, 1992. 104 Rønnow, Dues Kirsten: Nordisk Gandhi-bibliografi. - Lund : Transnationella Stiftelsen för Freds- och Framtidsforskning, 2004. Terp, Holger : Contemporary Nordic Gandhi Biography. Terp, Holger: Contemporary Danish Gandhi articles. In: Gandhi and Nordic Countries. 105 Petersen, Niels: Militarismen og Historieundervisningen. Danish Peace Society, 1893. - 12 pp. 106 Lawson, Max: The International People’s College 1921-96. 107 Nordiske Læreres Fredsforbund established in Helsinki, Finland. 108 Opdragelse til Fred. In: Fred og Frihed, 1937:10 pp. 81-82. 109 Ammundsen, Valdemar: Kirkeligt Verdensforbunds Tilblivelse og hidtidige Virksomhed. In: Freds-Varden, 1926:2 pp. 19-23. Verdensforbundet til Fremme af Venskab blandt Nationerne ved Kirkerne: Formaal. Ibid. 1926:2 pp. 30-31. Verdensforbundet til Fremme af Venskab blandt Nationerne ved Kirkerne: Konstitution for den danske Afdeling. Ibid. 1926:2 pp. 31-32. Ostenfeld, H.: Hvorfor og hvorledes skal Verdensforbundet Arbejde i Danmark? Ibid. 1926:2 s. 17-18. Sparring-Petersen, G.: Kirkemøde i Lausanne : Hvad vil Faith and Order Bevægelsen? Ibid. 1927:4 pp. 49-53. 110 Internationalt Venskabs Forbund. In: Fred og Frihed, 1936:7 p. 58. 111 Kvindelig Læseforening. In: Fred og Frihed, 1933:4 p. 8.